A healthy, good-looking smile is an essential part of your family’s overall health. There is a direct link between visiting the dentist and keeping your natural teeth. Highpoint Dental Care is a family-friendly dentistry office where we focus on preventing and treating common dental issues faced by patients of all ages . We realize patients may have dental anxiety and work to provide a welcoming, non-threatening environment. 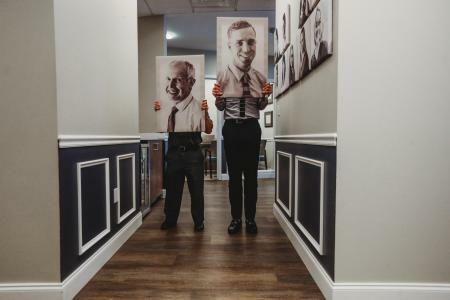 From toddlers to seniors, our dentists treat generations of families. 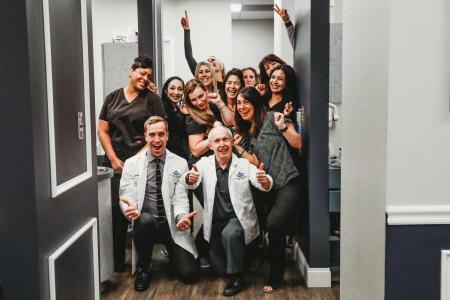 At High Point Dental, we truly see our patients as family and make every effort to provide a comfortable, welcoming, and inviting practice where your needs come first. If you live in the Aurora area and are looking for a dental team that is fully committed to the health and happiness of each member of your family, we encourage you to get in touch today! Schedule a dental exam for your whole family at Highpoint Dental Care today at 303-617-9100. Dr. Rowe and Dr. Baltz serve patients in Aurora, Parker, Green Valley Ranch, and Centennial, Colorado. During your bi-annual dental checkup, our dentists and friendly staff will make sure your oral health is in great shape and that you’re happy with the appearance of your smile. These visits are essential for many reasons because this is when severe problems such as advanced gum disease and oral cancer are identified. We’ll perform a visual inspection of individual teeth and gums as well as take images to find infection or decay living under the surface. If we see any signs of tooth decay, infection, gum disease, or potential symptoms of oral cancer, we will discuss your options. Minor cavities can typically be treated during your checkup. Highpoint Dental Care believes you should know what your costs will be before we begin any dental procedures. Our dentists will go over the treatments we feel are necessary to maintain a healthy, beautiful smile and make sure you know what to expect from your next appointment or consultation. If you’re unhappy with the appearance of your teeth, we can discuss your cosmetic dentistry options. Remember, we are here to help you achieve the strongest and most attractive smile possible. The suggestions that we make for your smile will be based on your specific concerns and all services will be customized to meet your exact needs. Before we send you on your way to your everyday activities, we’ll remove any bacteria and plaque buildup from your teeth. Our dentists emphasize gentle dentistry. Many people have a fear of the dentist or may avoid the dentist because they’re concerned something is wrong. We believe in completing your dental checkups in a comfortable and relaxing manner and will work to calm your nerves. If you do have a cavity or other oral health problem, we can address the issue carefully, so we can improve your oral health without causing more irritation and anxiety. It’s best to come in to see one of our general dentists for bi-annual checkups, but it’s particularly important if you have a toothache or mouth pain. It’s easiest to address the problem than let it spread, which will cause you more discomfort and pain in the end. We offer FREE nitrous oxide for nervous patients. Talk to us about your concerns and let us tailor your appointment to meet your needs. Good dental hygiene is especially important for children and that begins with brushing at home and regular dental checkups. Our dentists in Aurora believe preventative care is the best way to maintain your child’s overall health. We see children as young as 3 and understand they may be afraid of the dentist’s chair. Dr. Baltz, Dr. Rowe, and the rest of our staff take pride in offering a fun-loving atmosphere. Dr. Baltz himself is quite skilled at balloon animals, and we aim to have your child laughing and smiling from the moment you walk in the door. Many parents are unaware of the importance of oral health in the beginning years. The Centers for Disease Control (CDC) says tooth decay is the number one cause of infections among kids, leading to a high number of toothaches and missed days of school. Unchecked tooth decay can make it difficult for your child to speak clearly, eat, and do many everyday activities. However, there are many ways to combat cavities. Proper brushing and flossing at home is a start, but bi-annual checkups and regular cleanings are essential to get rid of bacteria and plaque before cavities form. We also recommend dental sealants and fluoride treatments. Dental sealants prevent food particles and plaque from getting stuck in the ridges in your child’s teeth when they bite and chew food. It’s easily done during each visit and involves a protective layer on the teeth to ensure nothing gets into those ridges. We simply brush on the material and let it harden. Fluoride has shown to reduce the risk of cavities by 30 percent and is found in public water. We recommend fluoride treatments, especially if you have well water at home. Our dentists use all of the tools at our disposal to make sure your child is comfortable and has pristine oral health now and as they get older. We know it’s hard to get children excited about brushing their teeth, which is why part of our job is to change their perception and show them the fun side of oral health. Preventative care and regular checkups can save your child many toothaches in the future. Our general and cosmetic dentistry office utilizes the most advanced technologies and techniques available. We use the CBCT 3D Scanner to capture high-quality images in both 2D and 3D. This scanner limits your exposure to radiation, offering faster and safer dental visits. We can take accurate images in as little as seven seconds using half the radiation as the standard scanners. The CBCT 3D scanner allows for accurate images for an improved view of your anatomy, which gives us an advantage when it comes to diagnosing problems, developing treatment plans, and predicting surgical outcomes. The device has many benefits for us as well as you, the patient. The CBCT means fewer appointments, faster treatments, and the comfortable design causes less stress. It allows our dentists to provide more dentistry services without referring you to outside imaging centers. Most adults will experience gum disease at least once in their life. The first stage, gingivitis, is largely reversible through better oral hygiene habits and regular cleanings. Gum disease often begins with irritated gums that are red, swollen, and bleed during brushing or flossing. When left untreated, gingivitis becomes periodontitis, which can then turn into the third and irreversible stage, advanced periodontitis. Your gums will begin to recede, exposing more of your tooth and roots to food particles and bacteria. Recent research has linked advanced gum disease to heart disease and diabetes because that bacteria can spread through your bloodstream. Tooth loss and jawbone resorption often occur as well, making treatment critical for preserving your teeth, gums, and bone. Traditional gum treatment involves pulling your gums away from your teeth and then using metal tools to remove the tartar, plaque and lingering bacteria that’s collected on your teeth and beneath your gums. This method is uncomfortable, but laser dentistry has revolutionized the way we treat advanced gum disease. Our dentists use lasers for periodontic care to break up the tartar and plaque and remove irritating bacteria that’s causing the gum disease. Laser dentistry allows for gentle gum disease treatments. It’s non-invasive, making you feel better right away, and the gums typically return to good health. Highpoint Dental Care can also replace lost or broken retainers as well as address all of your dental concerns. Choosing the right dentist for your entire family can be overwhelming. You want a dentist you and your children feel comfortable with. Our dentists work diligently to create a fun atmosphere while focusing on oral health and patient education. If you’re looking for a family dentist, please contact Highpoint Dental Care in Aurora today at 303-617-9100 to schedule an exam for you and your family. Dr. Rowe and Dr. Baltz serve patients in Green Valley Ranch, Parker, Centennial, Aurora and surrounding areas of Colorado.